GAY NINETIES: Seldom surfaces for auction sale. It is one of the top pitchers from Millersburg. Extremely rare and highly sought after! 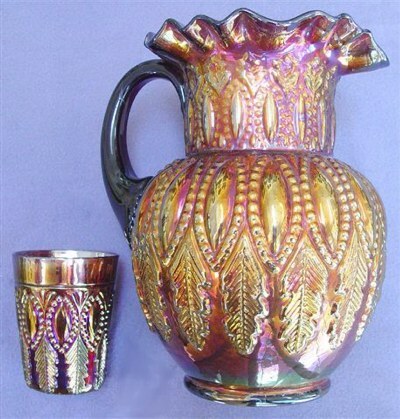 There is thought to be one green pitcher, and three in amethyst. Marigold pitchers are known. An amethyst example brought $5250 at the 2004 HOACGA Convention sale. Excellence in workmanship is displayed overall, with leaf veining shown at the top of the solid handle. 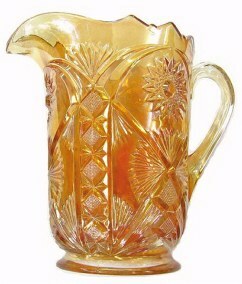 It's a winner; considered to be among the top two or three water pitchers to collect! 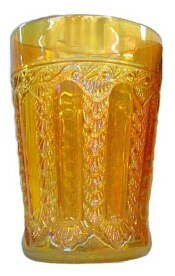 The two tumblers shown were sold in March 2006 during a Wroda carnival glass auction in Greenville, OH. 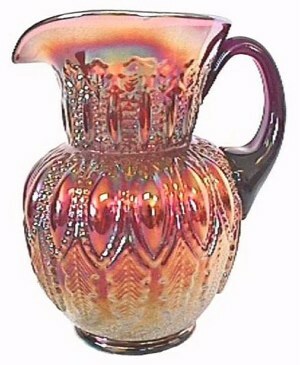 PERFECTION: Not only is the water pitcher in this pattern very rare, it is highly rated for beauty. 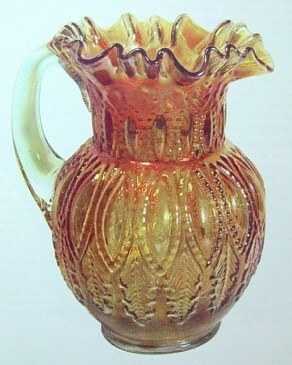 Standing 9” tall, having a top opening of 6”, it is bulbous in shape, similar to the Gay Nineties pitcher. An example in green has a ruffled top opening. Few of these are sold through carnival glass auctions in any given decade. An average of only 5 in that given period of time sell at auction. Amethyst is easier to locate than green , with possibly fewer than six marigold examples known. Estimates are that only three perfect marigold exist. A marigold with ruffled top having a crack in the bottom brought $1,000 in a John Woody Auction - April 2006. Perfection tumblers in amethyst are more readily found. 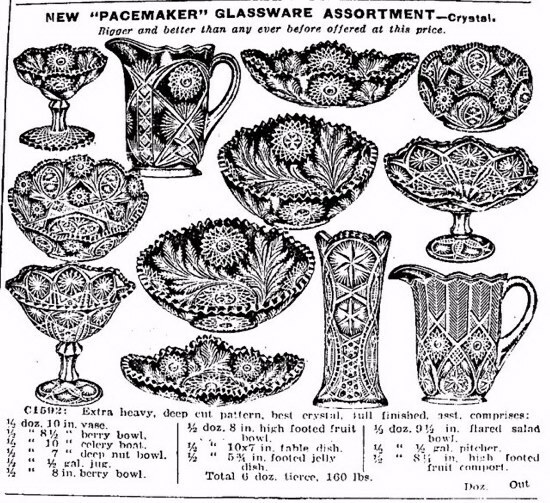 Only one green example is known, with four marigold tumblers reported. 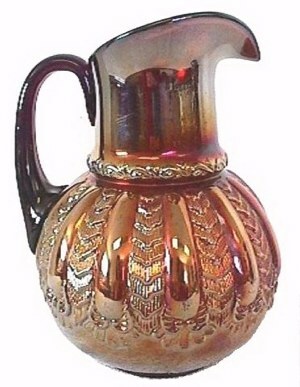 FEATHER and HEART: The pitcher stands 8” tall, with the amethyst and marigold offered more often than the green or vaseline examples. Some of the carnival pitchers lack good color, but complete water sets are scarce. A vaseline Feather and Heart pitcher brought $14,000 in 1994. 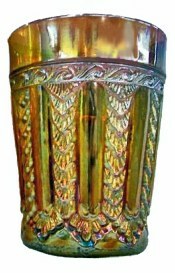 A spittoon-like whimsey made from a tumbler sold that same year. MARILYN in Glorious Green!Pitcher sold for $2000. tumbler for $390.-March 1999-Wroda Sale. 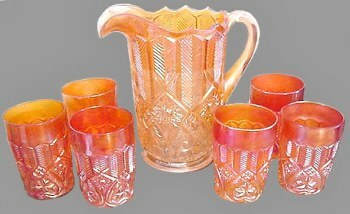 MARILYN: This lovely pattern was produced in crystal-pressed/cut about 1909-1910. 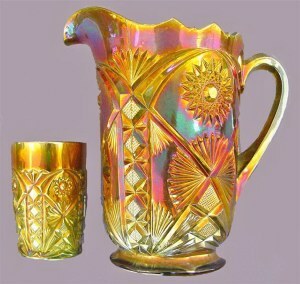 Water pitchers and tumblers are the only known iridized shapes within the pattern. Rarely offered for sale, the values remain high, as does the interest in purchase when availability presents itself. Colors known are amethyst, green and marigold, with green having the higher market value. “Iridescence IS the Essence” of all carnival glass! It ALWAYS produces a higher selling price, especially when NO damage is present! 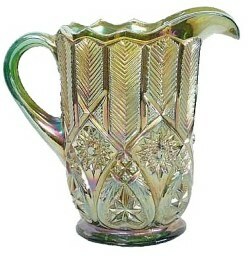 The Green Pitcher shown here in all its glory sold for $2,000 in March 1999 during a Wroda Sale in Columbus, OH. The green tumbler sold for $390!..... IRIDESCENCE IS THE ESSENCE!! 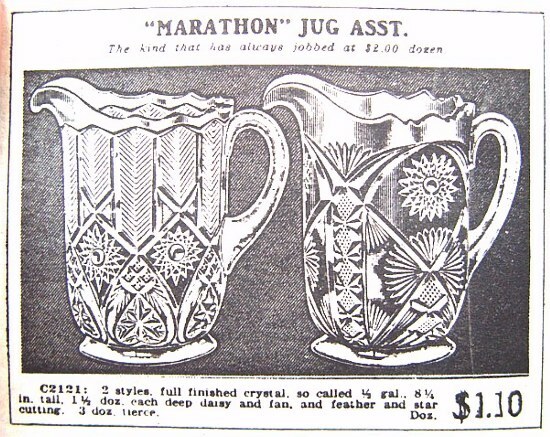 April 1912 Butler Bros. ad verifies FEATHER AND HEART and MARILYN pitchers. Psalm 18 is a song of celebration. On the day that the Lord rescued David from Saul's murderous pursuit, David's instinctive reaction was to celebrate God's goodness, protection, and strength, and to reaffirm his love for the Lord.